Review Summary: Though far from amazing, Deathcrush harks back to the crude beginnings of the Norwegian black metal scene that has become infamous today. At one point or another, the average black metal fan has heard of Mayhem. If you have, you know that Mayhem are notorious for the havoc that seemed to engulf them during the early days of their career, as well as the extreme form of metal they pioneered in the late 80's. The Deathcrush EP is the debut effort of the band, issued in 1987. 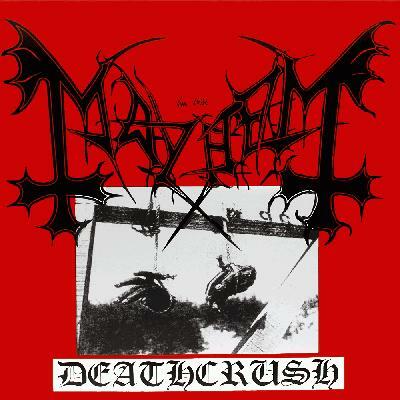 Although Mayhem were one of the first bands to have embarked on the path of the primitive sound of the Norwegian Black Metal movement of the 90's, it is clear on Deathcrush that some elements of death metal are present throughout the album. These death metal nuances are most visibly incarnated in the riffage of Euronymous, as well as the gore-laden, gruesome lyrics. Mayhem were never known for virtuosity. As far as the band's individual performance, singers Maniac and Messiah do a good job. Messiah is the better of the two by far as he gives a much more manic performance. Both vocalists' use of harsh rasps and screams accent the music well, although I prefer Dead, their legendary successor. Manheim's main objective seems to be as fast and chaotic as possible behind the drums, however his slower work is found on Chainsaw Gutsfuck and adds a sinister feel to the song. The only track the percussion actually stands out on is Silvester Anfang, in which all Manheim succeeds in doing is annoy the listener. Necrobutcher's bass is deliberately turned down so it is for the most part inaudible. Expect heavy guitars riffing under indecipherable lyrics about rotting corpses and entrails. Most people complain of a lack of talent when it comes to black metal bands (as well as many other kinds of metal bands) such as Mayhem. Personally I don't listen to Mayhem or Darkthrone for awe-inspiring solos or catchy choruses, I listen to them for the aggression, chaos, and well, mayhem. The music is raw, energetic, memorable enough to inspire headbanging. A track-by-track review would be pointless considering this EP is a mere 18 minutes long. In my opinion it stands up to Mayhem's studio follow up in all categoriest except length and complexity. As a whole, Deathcrush has its ups and downs. If you are attracted to early black metal, this is necessary to have in your collection. If not, turn another stone. However, some solid advice I can give for a person of either of the two aforementioned groups: Don't waste your time and money buying a $20 import online unless you really like this. A hard copy will be tough to find at an affordable price for such a brief release, but if you want to get this without spending too much I recommend buying it on iTunes ($5.94). Mayhem doesn't appeal to me, but good review. Awesome review. Few syntax problems towards the end but we can work on that :P You've always been more concise and wit than me and I admire that; I'm a lousy reviewer. I have never heard of these guys but I'm going for De Mysteriis Dom Sathanas to delve into a better start. That's one I think, but here its rather a logical connector. It should be "where/on which they had yet to fully develop the sound they sought". Correct me if i'm wrong. Too many commas I guess, should be a full stop in there somewhere. Sorry for picking them out, but I was desperate to find some constructive criticism, and this was just about it. Well who am I to question such a great review ;) I got the mysteriis album, so gonna knock myself out now. They have a copy of this for $24 at my local record store, I just may buy this. It might be, but this is an Imported album so the cost will be much higher. My copy of "The Black Waltz" by Kalmah cost me $30 because it was an import. I buy it, I hate piracy. I also like having the actual album case because I like looking at the band pics and reading the lyrics. I like to give my money to the bands I enjoy, so they can make more music. I buy every single thing I can, but if I can't find it, I ask for it. I got this through sharing. I really enjoy this album, and I really want to get as it is quite a trademark in Black Metal. i own dmds now, i traded my friend diabolical fullmoon mysticism for it. i like dmds much more than this but yeah this is still a great cd. i gave it a 3 only in absolute honesty of the musicianship, songwriting and singing. i may raise my personal rating to 3.5 though.